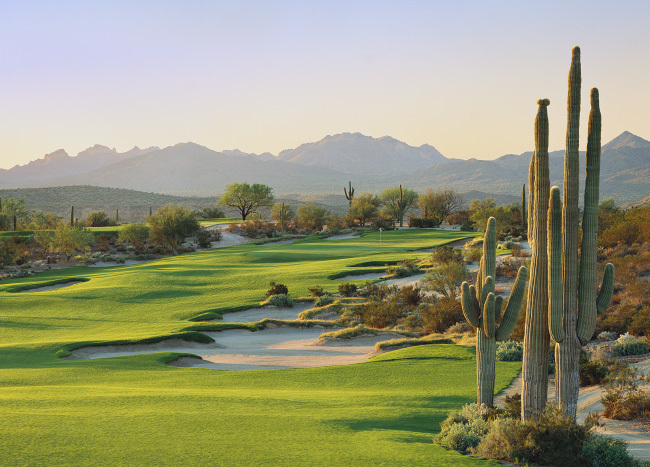 Broad, rugged landscapes highlight the experience of We-Ko-Pa’s Saguaro Course. One of the reasons Bill Coore and Ben Crenshaw’s golf courses are held in such high regard—by architectural cognoscenti, by magazine ranking panels and international developers—is that they’re so often, so obviously, brilliant. The pretext is that they’ve been hired to construct courses on some of the greatest sites made available in the last 40 years. But when they get there, they nail it. Sand Hills, Bandon Trails, Friars Head, Cabot Cliffs, Streamsong Red — even their work restoring the primitive look of Pinehurst No. 2 — this is golf art in the highest form that will endure into the next century. A second reason is that their product is rare. To date there are less than 30 Coore-Crenshaw original designs in the United States. Just 12 of them are open to the public. Supply, demand and location suggest that most golfers will only ever play a handful of their courses, and they’ll likely need to travel to reach them. Golfers in the Phoenix market are more fortunate, where there are 54 public access Coore-Crenshaw holes. 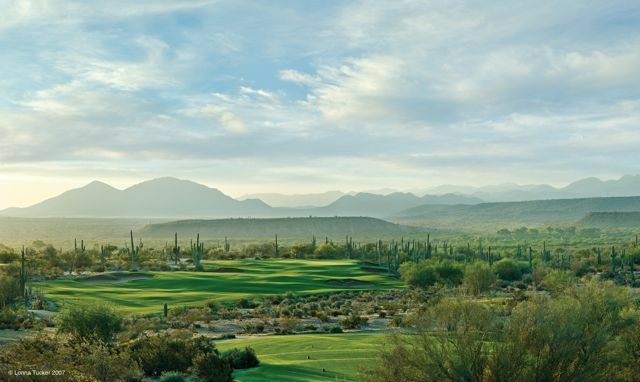 Comparing Talking Stick, specifically the O’odham Course, and the Saguaro Course at We-Ko-Pa, each located east and north of Scottsdale, shows how adept the architects are at adapting their designs to different properties. 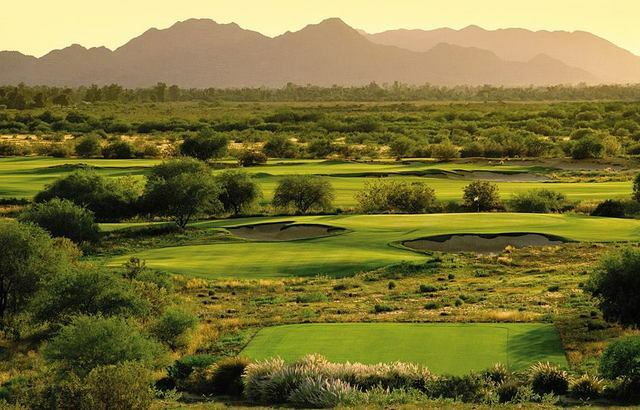 Both Talking Stick North and the Saguaro Course share ubiquitous desert features but otherwise they could hardly be less alike while still displaying Coore-Crenshaw less-is-more mantra of minimalism and naturalism. So how do these courses stack up against other Coore and Crenshaw courses? How do they stack up against each other? Talking Stick’s par-3 7th, a pop of liveliness amid a sea of flat desert. Coore and Crenshaw built the North and South courses at Talking Stick in 1997 with relatively little fanfare. Sand Hills, which remains their magnum opus, was still in the process of becoming an international sensation and the architects’ reputation at the time they signed on for the Talking Stick job was on the ascent but still in development. In 2005, when they returned to build the Saguaro Course at We-Ko-Pa near Fort McDowell (to accompany Scott Miller’s Cholla Course), everyone was paying attention. 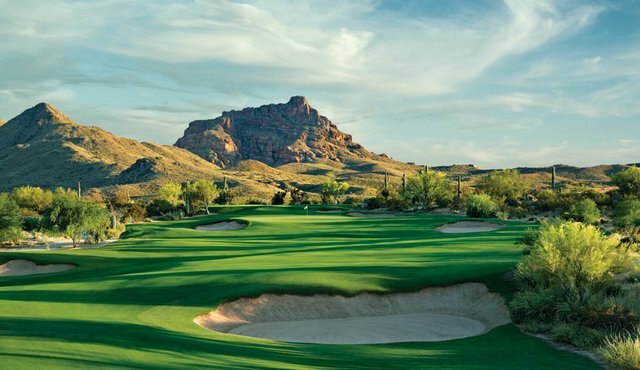 The media coverage surrounding the opening of the Saguaro Course was saturating but not unwarranted, and it remains a must-play to residents and enthusiasts who visit the area. Talking Stick, meanwhile, still keeps a lower national profile though locally it receives heavy play. Both courses rate high among panel experts, holding spots on Golf Week’s State-by-State public course rankings. We-Ko-Pa—Coore and Crenshaw were surely attracted to the limitless, undeveloped landscape on the north side of the Cholla Course. The undulous site is rippled with ravines and mid-scale movements with notable climbs of elevation on the north and western boundaries. To a similar but far lesser extent it must have reminded them of Sand Hills: an expansive, isolated chunk of land with a recurring indigenous character and enough room to route the holes in any combination of directions. Talking Stick North—…is just the opposite. The land is flat, with almost no natural movement save for a small gulch that crossed the property. The holes had to be layered into a rectangular parcel with few defining natural features other than desert sand and pockets of low vegetation. Coming off prime properties like Sand Hills and Cuscowilla in Georgia, this project would have intrigued them as an almost purely theoretical challenge, a philosophical exercise in how to create strategy, beauty and interest in the absence of physical cues, and without greatly manipulating the land. The gorgeous, open setting and ideal ground movements sold Coore and Crenshaw on the We-Ko-Pa site. WKP—A muscular rather than elegant golf course, but very much what you’d expect from Coore and Crenshaw with holes laid or revealed atop the land in ways that highlight its most interesting features. There’s plenty of room to explore with the driver, solitary moments of pause, an emphasis on recovery shots and the uphill-downhill shot patterning we find at many of their best sites. If there’s one surprise it’s the formality of the bunkering, which aside from some desert transition areas doesn’t always meld and erode into with the landscape the way we might expect. TSN—A more patterned and rhythmic routing due to the economy of space, with many parallel holes and frequent switchbacks. The internal twisting creates the effect of descent, of spiraling deeper into a puzzling labyrinth, especially compared to the outward seeking adventures of We-Ko-Pa. Yet somehow Talking Stick seems to get as much if not more out of the ground than We-Ko-Pa.
WKP—The par-5 14th is a classic two/three-shot Channel hole, named after a famous alternate-fairway hole at Charles MacDonald’s extinct Lido course on Long Island. A smaller right-side inland fairway is separated from the more accepting left fairway by a ravine and requires a difficult drive across scrub and cacti-littered desert to reach it. If pulled off, there’s a superior angle and shortened approach into a deep, narrow green that falls off hard on the right. TSN—The Channel-style 12th hole is one of Coore and Crenshaw’s most creative. Here, instead of the traditional par-5 we have a short par-4. Take the narrow and far more dangerous left hand route (with OB all along the left) and it’s possible to roll the drive near or onto the putting surface. Safe drives out to the right fairway leave just a short approach but from an awkward angle, especially when the pin is up or right. 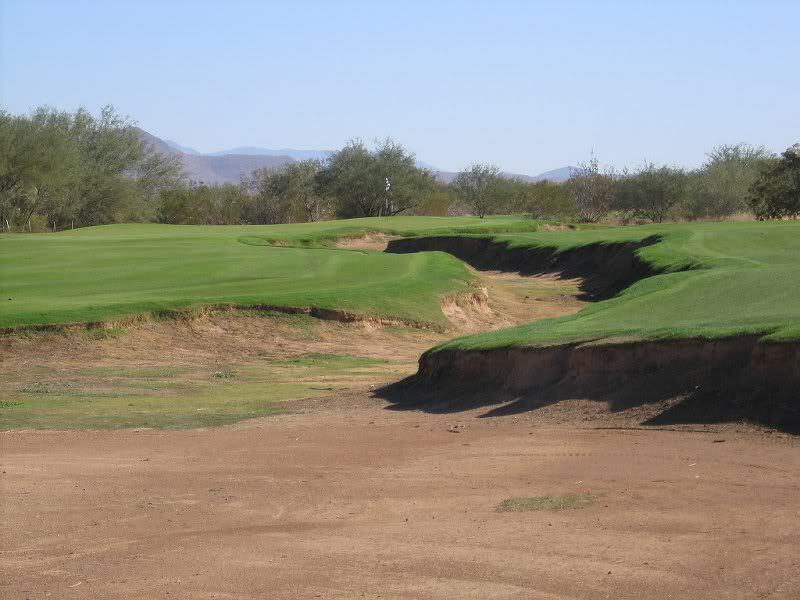 You may have difficulty advancing your ball from the nasty desert canal separating the two fairways if you miscalculate. WKP—Driving is a thrill as some of the fairways are 65 yards across with only a light rough buffer before the desert begins. Width is one way Coore and Crenshaw have managed to create strategic interest in nearly all their designs, giving the player room to maneuver drives and calibrate various angles into the greens. TSN—The fairways are consistently wider at Talking Stick, an even more impressive achievement given the space constraints of the property. Both courses feature bunkers and center hazards cut into the lines of play, a taboo for many designers, but Coore and Crenshaw employ this simple defense beautifully to emphasize the need to strategize from the pin backward. Its most relevant here at Talking Stick. Width, centerline hazards and subtle ground movements give Talking Stick North a throwback links feel. WKP—A drivable par-4 at the second hole is a great way to kick off the round, and the downhill par-3 15th is probably the most beautiful. However, it’s the 337-yard 10th that shows Coore and Crenshaw at their wily and opportunistic best. Reachable for titans in certain downwind conditions, the downhill drive cuts across a corner of scrub. Pin position on the sloping green (which is shaped like a salmon steak with two meaty filets flanking a front-center vertebrae bunker) dictates everything. TSN—The par-5 2nd is one of the most remarkable simple holes I’ve ever played. The fairway is a 72-yard wide airport runway, though the property’s western boundary abuts it tightly on the left all the way to the green. You can almost hit it anywhere on your first and second shots (too far left is OB) yet the green is also located paces from the OB with two bunkers guarding its right side. So while the hole is as wide as any you’ll likely ever play, great precision and strategy is required to safely hit the green in either two or three shots—you simply must, at some point, challenge the boundary line to get a good angle to the green. WKP—In almost any evaluation We-Ko-Pa’s Saguaro Course would be considered the more substantial course. The ground movement, the ambition behind the product, the backdrop and the adventurous strategic DNA all would appear make it a more complete enjoyment for most players. The weakness, however, is that it lacks grace and the memorability of Coore and Crenshaw’s finest work. As striking as the signature saguaros are, the muscularity of the design and the setting can white-out nuance and make the golf seem unforgiving. The routing, for all its strengths, puts it almost beyond the cusp of walkability despite the architects’ effort to make it such (92). TSN—The creativity required in making a flat, nominal site as interesting and fun as this course is demands serious study and hearty applause. It’s a rare occurrence. Though located in the American southwest, this is really a throwback Scottish links-style course in its open-endedness and the way it utilizes its unique space and the property’s boundaries. The criticism is that it runs aground midway through the second nine, almost as if all the creativity required to make it outstanding was used up through the first 13 holes. Beginning around the 14th hole the routing falls into a back and forth lull (I’m sure due to practical reasons), so more pronounced ground contour was built to keep it interesting. Coore and Crenshaw probably thought their job was to usher players to the point there where the appearance of natural movement finally takes over. But they’re being too modest–the best holes here are the ones that are nakedly the product of the architects’ minds (93). The breathtaking vistas of We-Ko-Pa, here, the short par 4 second. Hi Derek, as a fellow golf course architecture enthusiast, I recently found your Feed The Ball podcast and website. I happened to spot a photo of Talking Stick North #12 on this page to illustrate your Channel Hole discussion. It caught my eye because I took that photo on a golf trip in December 2006! For a while I had that photo and others from TSN posted on the now-defunct photo sharing site Webshots. I would be happy for you to continue using the photo if you simply add a photo credit to it. Since you are a professional writer, I’m sure you appreciate the importance of copyright and proper attribution of someone else’s work. I have attempted to contact you via your Twitter account but received no reply. I look forward to seeing the proper credit given, and please contact me by my email or Twitter (@Griffin_Golf) if you have any questions. Best regards! John, I will absolutely credit you with the photo. I apologize for not doing the proper research to credit it when I posted the story. I hope you will accept my apology. I was desperate for a photo of that hole and you nailed it. Derek, thanks so much for adding the credit – very much appreciated! Ironically I chose to use that photo for the banner image on my Twitter account when I set it up a couple weeks ago – so I kind of did a double take when I was later browsing through your website and saw it! I really enjoyed that day at Talking Stick – managed to squeeze in a round on each course even with a frost delay. TSN was so much fun. I agree with your comment that it starts to fade a bit in the middle of the back nine, but it’s just a testament to the amazing creativity of Coore & Crenshaw and their team for what can be done on a flat site. When I look at my photo of the tee shot at the 2nd, I still can’t believe the extreme width there – such a brilliant hole! Unfortunately WKP Saguaro opened a few days after my trip there and I haven’t had a chance to get back. Thanks again and looking forward to future content on Feed The Ball. Being Aussies and fans of C&C’s Lost Farm we cant wait for our trip in November when we will be playing these 2 courses. Lots of people seem to bag TS for its featureless land so it will be interesting. Love those short par 4s. Check in after you’ve played these two. I’ll be interested in your reaction. Much more to look at playing We Ko Pa but the simplicity and strategies at TS fascinate me.